Cherrapeno: Nutella Snowballs for a Snow Day! I love Nutella!! Especially when it's warm and melting! 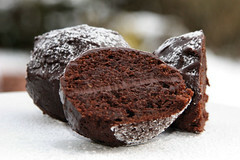 I think I just put on 5lbs just looking at the pictures, but I definitely HAVE to try these! These look fantastic. I love the idea of the pan you have You can't beat Nutella! Those look positively divine, Nic! I LOVE Nutella! delicious! those look amazing! I'm so sick of snow...but i'll never get sick of nutella! These look awesome! What a clever (and scrumptious) idea! How did I miss Nutella Day? Your snowball cakes look awesome. I would love to have a bite. Maybe I can try that recipe soon. Nigella's cakes are always delicious. Glad you are loving the snow. It looks beautiful! Nic, how lucky you are. The snow never really settled up here in Manchester. The nutella balls look amazing. What a wonderful idea for a snowy day! Such cute little cakes. Oooh we have snow too!!! Those Nutella balls look lovely! I LOVE Nutella. However, I cannot keep a jar of it around, bc I always find myself w/ my finger in it! 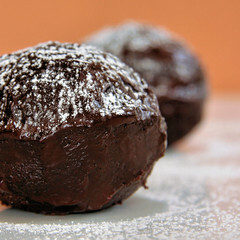 I'm thinking I could eat quite a few of those Nutella Balls! They look fabulous! WOW...I think about 2-4 of these would really satisfy the chocolate craving I am in the middle of. They look wonderful! The snow photo is so pretty. What a nice countryside you have to view. Now that cake is the best! It looks great made into balls! I love this, the nutella cakes looks so moisty and dense....omg!! there is something waiting for you at jugalbandi. congrats! OMG!!! i want... i could live on Nutella!! I adore nutella!! One of the best ways to eat nutella, is with a big spoon straight from the jar, lol. 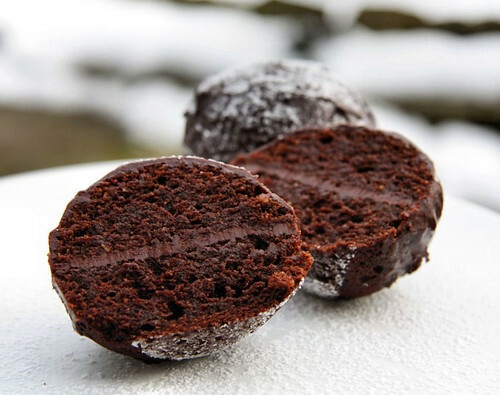 Your Nutella Snowballs look divine. if ever a substance merited a day of celebration, it's nutella. these look sensational, nic! Nic, no body creates Nutella goodies like you and I adore these Nutella snowballs so keeping with the amount of snow we are getting here. Nic they look divine! I didn't know it was Nutella day, I missed it. Hurrah for snow and nutella snow balls! Did the birds like them? Just gorgeous Nic...& I might as well tell you again that I am green with envy of the white fluffy stuff! 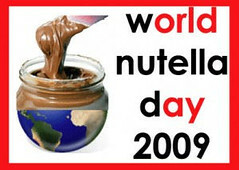 I can't believe I missed Nutella day, I love that stuff! These look great and perfect for this snowy weather. Wow, that looks like the perfect, decadent mouthful of joy right there. Mmm! Oh my! *faints* that is positively the most charming thing i've ever seen! or, in a long while! Those look so delicious. Nigella's Nutella cake is one of my favorite recipes! Oh, and the snow looks just gorgeous! What a treat! I love the idea of teensy weensy little cakelets, plus Nutella. Bonus. And wasn't the snow absolutely fantastic?? My DH would love these little Nutella treats.....He is a chocaholic!!! These little balls are perfect for all the snow. I love the way they look, like little truffles of cake. It sounds delicious. Such a wonderful idea - they look very tempting. mmmmm they look so tasty! There's a Nutella Day? Where have I been? And I love Nutella. Unfortunately, so do my kids. So I'm always finding the empty jars I personally hid in the back of the pantry. I seriously need to find a better hiding place. Btw, Nic, those Nutella Balls are quite the tease. This are a wonderful idea for winter. They look and sound amazing. I love nutella day! YIKES! Holy Lord. Do these ever look GREAT!! Wow, I'm about to attack my screen. PERFECTION! What a perfect theme for the weather. I love nutella, and always have it year round in my house. Cool shape and I like the flavors! Nutella is so addictive. Wow, this is so creative and looks divine. I am collecting nutella recipes for my husband's company's french volunteers who can't get enough, especially when paired with chocolate!